I was just telling this story to a friend the other day. A few years ago Todd and I visited the United Arab Emirates with our friends Sean and Heidi. We packed a lot into that week. We visited Dubai, went scuba diving in the Arabian Sea, we haggled for spices, went sand boarding (kinda like snowboarding, but down a sand dune in the desert) and so much more. We learned as much as we could about the local culture, and researched some of the customs before traveling. For example, we learned that public displays of affection, even holding hands, is frowned upon. I stressed about what to wear, as I learned that I should cover my shoulders and knees. It would be hot there in April. I went to REI and bought out have the store’s collection of lightweight long sleeved shirts and pants I could easily roll up to just below my knees. Another thing we learned is that the laws in the UAE are very strict, and that law enforcement tends to value the side of an Emirati citizen over a foreigner in the case of a dispute like a car accident. 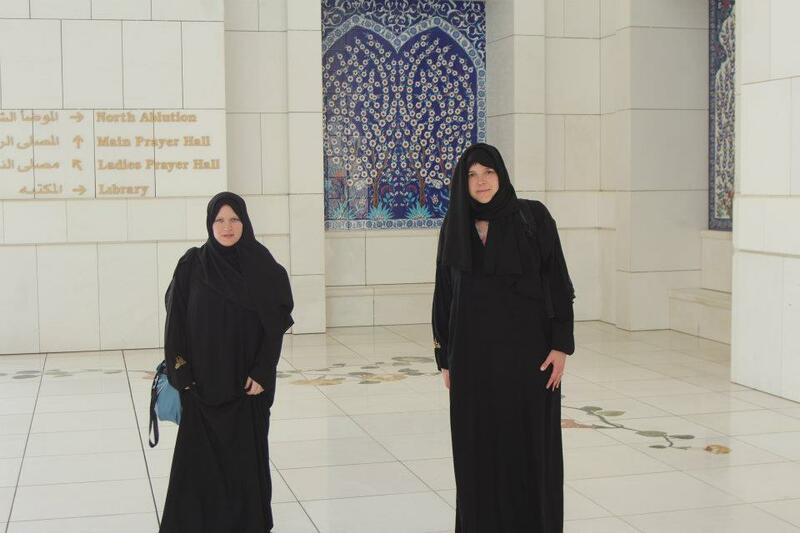 On the day we were going to visit the Grand Mosque in Abu Dhabi, we went to lunch in the city. Parking in Abu Dhabi was very challenging. To save time, Todd dropped us off at the restaurant and then he drove to who knows where to park the car. Sean, Heidi and I sat down at a table and waited for him. We nibbled at the sliced veggies placed in front of us, and the fresh hummus and pita. (This was amazing! Fresh hummus and pita! Everywhere!) Several minutes went by, longer than we’d think it would take for him to park the car. Where the heck did he park? Qatar? Then he showed up at our table, with dried blood on his face and blood stains on the front of his shirt. “I don’t want to talk about it,” he grumbled, then took a swig from his water. Sean, Heidi and I exchanged glances. I wanted to press. I wanted to stand up and demand to know why he had blood on him. Where the hell was he? What the hell happened? Heidi gave him one of those detergent wipe things, and he went to the men’s room to get cleaned up. Our food arrived and I picked at it. His water glass was refilled and he came back to the table. We weren’t talking. Four good friends, not talking. The blood on his shirt was cleaned away, but I still wanted to know how it got there in the first place. Finally he got a few bites down, and more water. He was calm enough to tell the story. He tells it way better than I do, so you’ll have to suffer through my telling of it. He had parked the car several blocks away, and was walking back to join us at the restaurant. He was standing on the corner waiting for the light to change. There was an elderly Emirati woman standing near him, she was talking to another person and she was gesturing with her hands. In her hand was a cane, and she gestured so wildly that she managed to clobber Todd across the nose with her cane. He fell backward. His nose immediately started to bleed. She started sputtering in Arabic. He started sputtering in English. She started to cry—presumably she felt horrible at having clocked my husband with her cane and made his nose bleed. A crowd started to form. Shouting in Arabic. The police came and saw an Emirati woman crying and an American bleeding on the ground. What did he do to her? Fingers pointed, the situation escalated. I sat in a restaurant nibbling on pita and hummus a few blocks away while my husband feared being apprehended for whatever crime he’d committed against this little old lady. When I think back on it now, I wouldn’t even know where he’d parked the car, where they’d taken him, or how to find him. Eventually I’d end up at the Embassy to see if I could determine what became of my husband. The crowd escalated in front of him as he was sprawled on the pavement with blood gushing from his nose. Eventually a witness came out from inside a shop and managed to convey the story in Arabic. That Todd had done nothing wrong. He was accidently struck by the lady’s cane, and she was too hysterical to properly explain. The crowd was somewhat subdued, but Todd still felt threatened. A British man approached him and said “They know what happened, you should just leave.” The crowd started to disperse as Todd left the scene. He made his way back to the restaurant, through the streets of Abu Dhabi, with blood running down his face and onto his shirt, until he finally made his way back to me. We left the restaurant and headed for the Grand Mosque to visit it at sunset. And our dream adventure vacation continued as planned. 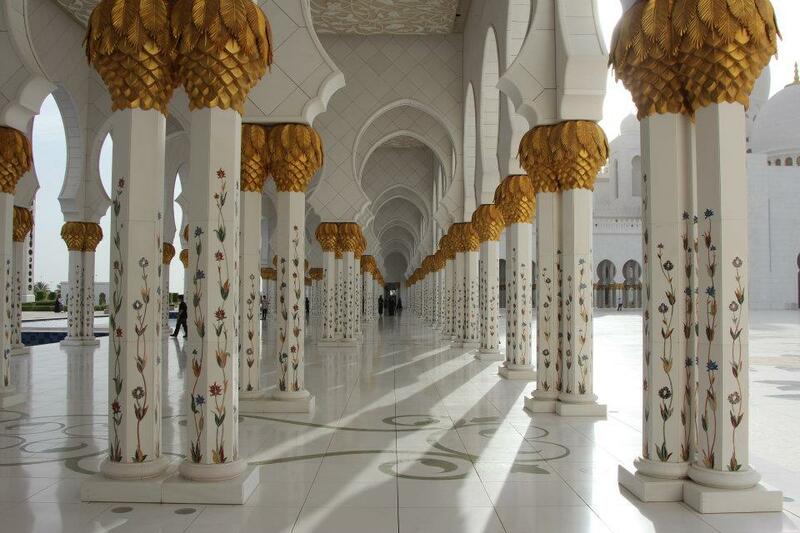 This is the Grand Mosque, which was a highlight of the trip. All of the columns had these marble inlays. 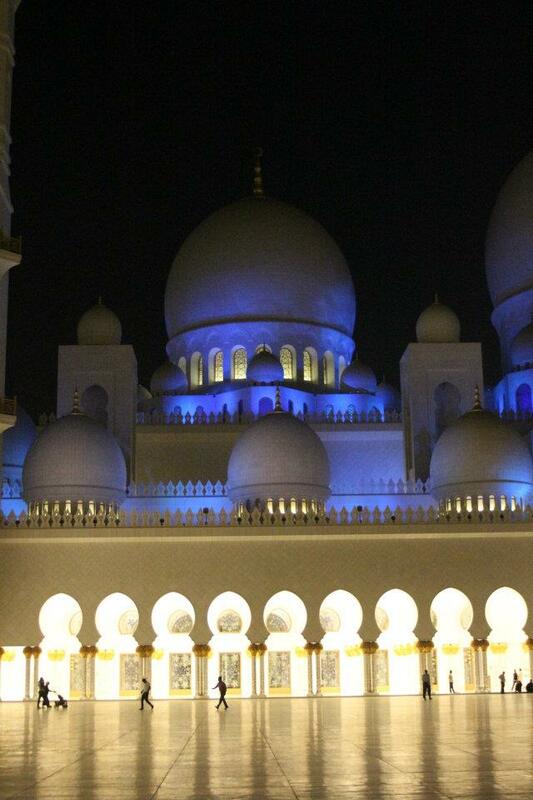 This is the Grand Mosque in Abu Dhabi after dark. Heidi and I had to cover up before entering the mosque.